I'm a frequent visitor to Cameron Highlands. I love the cooling weather (although it's getting hotter each year when I return) and I love being surrounded by nature. 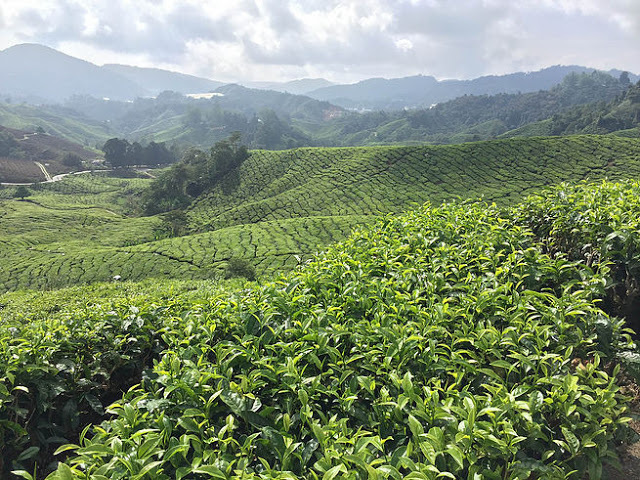 Cameron Highlands is my ideal place to retire, so I make it a point to explore the place little by little. I find that each year, there will be something different, a new road is paved, a new building is erected and development is unstoppable. It's a pity that the old Cameron Highlands is no longer visible, but this place has a special spot in my heart. Most of my friends often ask me where they are the good places to eat, so I thought I should compile it in a blog post to make it easy for everyone's reference. Never miss the Sungei Palas Boh Tea Plantation. Despite the name, there is a very cool tea house at the plantation. The teh tarik is my usual order. Somehow teh tarik tastes so good here, perhaps because it is freshly picked and processed there. There is also a savory menu where you can order some bites to go with your tea. The best spot to have your tea is at the verandah overlooking the tea plantation. This is also where you can get the best spot for photo. I always crave for the smoked duck at Jasmine Cafe. It is a pub more than a cafe. The smoked duck has always been the best seller here. It comes with two options - the normal smoked duck and the flaming smoked duck. I would recommend you to order the normal one because the flaming smoked duck is drenched with gin. In my opinion, the taste of the alcohol affects the original taste of the smoked duck. I like the salmon steak here too. But for first timer, I would recommend you to go for the smoked duck. 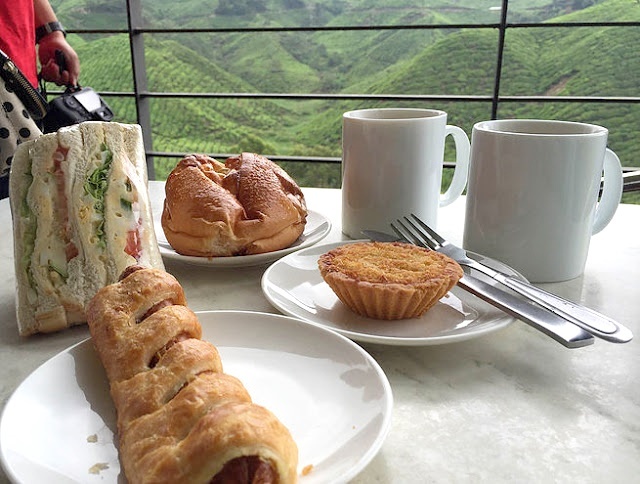 Arguably the best afternoon tea in Cameron Highlands. The afternoon tea set comes with various Western and local cakes & savory, paired with the locally produced tea. For the price of RM45 per person, this is a deal to steal. If you are a guest of the hotel, you can opt for a picnic afternoon tea by the tea plantation. It is only available from Tuesday to Thursday. I will blog about the Cameron Highlands Resort in a separate post. You can definitely drop by at the hotel for an afternoon tea even if you're not staying at the hotel. This is a recent hype at Cameron Highlands. It is almost customary to try out if you've not been there. The nasi lemak is served with strawberry sambal (not exactly different from the usual nasi lemak sambal, except the taste leans towards sweet instead of spicy). The red colored rice is unique but I wasn't quite mentally prepared for the taste. It has a hint of strawberry flavor but can be easily overpowered by the sambal. The fried chicken is good though. Definitely a one-time trial option. Can be skipped if you have other better place to go to. For a cafe that is much familiar to the city people, try the new Mossy Forest Cafe for brunch or tea. We tried the mushroom soup & salted egg chicken burger. Both were extremely good. The mushroom soup is made of fresh mushrooms picked from nearby farm and promising a genuine mushroom flavour. They don't serve you ready-made canned mushroom soup. And the burger comes in a generous portion of chicken patty with charcoal bun. It was a pit-stop for us here while waiting for the rain to stop, otherwise we would love to have a full meal here if our next food stop was not planned. You can have variety of beers at this cafe too. Because of the new setting, more Western food options and the food is pricier (same price as in city cafes), this place probably appeal to the younger people. A trip to Cameron Highlands is not complete without a full course steamboat meal. I have been to the Cameron Organic Produce Steamboat restaurant twice and I would love to go back for more. As the name suggested, the vegetables are extremely fresh and it is sourced from organic farmers around Cameron Highlands. You have an option of chicken broth or herbal based broth. I tried both, but personally prefer the herbal broth for the strong flavour. The broth are made without MSG or additional flavouring. I didn't take a photo of the steamboat cooking because I was busy cooking & eating at the same time. With Ah Xian cardboard mannequin promoting outside the restaurant, you know this place can't be that bad. There are several complains online about this restaurant which I think don't do justice. During busy hour, it is best to avoid this place if you're impatient because the owner has a bad temper. Otherwise, just focus on the food. The homemade sauce is to die for! Lord's Cafe at Tanah Rata - Apparently the scones are near perfect. The Smokehouse Breakfast - They serve traditional English breakfast. If you've been to those places, do let me know if it is good.